Lots to report. 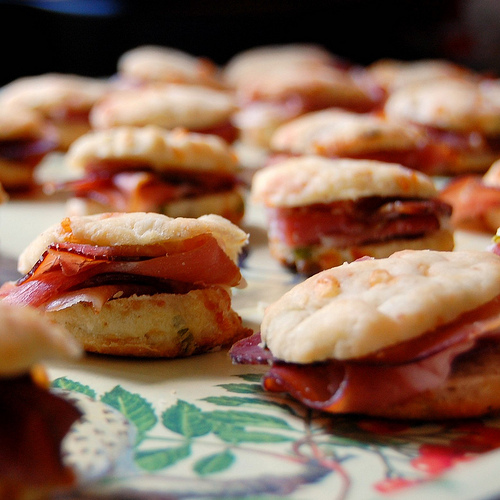 Dine gluten-free (plus vegetarian) in Lawrenceville and on Simply Grazin’ organic meats in Hillsborough. My radio encounter with Vetri and his lifelong stutter. Participate, please: March against Monsanto, cheffy benefit for one of my favorite NJ nonprofits, first ever Montclair food & wine fest. The space that had been the Lawrenceville Inn has morphed into an artisan bakery and daytime cafe featuring made-to-order savory and sweet crepes, breads and pastries – all gluten-free. The cafe menu (you’ll need to click to enlarge) also offers housemade soups, salads, and smoothies (also gluten-free and vegetarian). 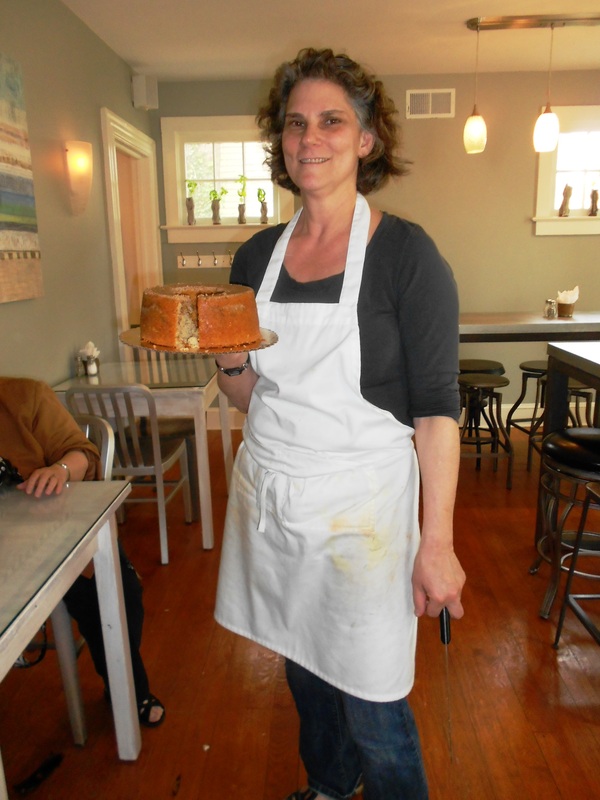 The gal behind Wildflour is Marilyn Besner, shown here holding one of her exceptional coffee cakes. 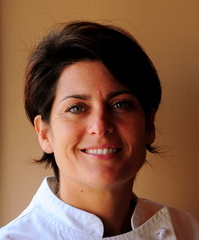 Princeton-area foodies known her from Moonlight Bakers, her previous strudel-making venture. Besner used her training at The Natural Gourmet Institute and French Culinary Institute to develop her own blends of flours, using everything from amaranth to quinoa, which result in exceptionally light textures, even for cream puffs and pastry for fruit tarts. 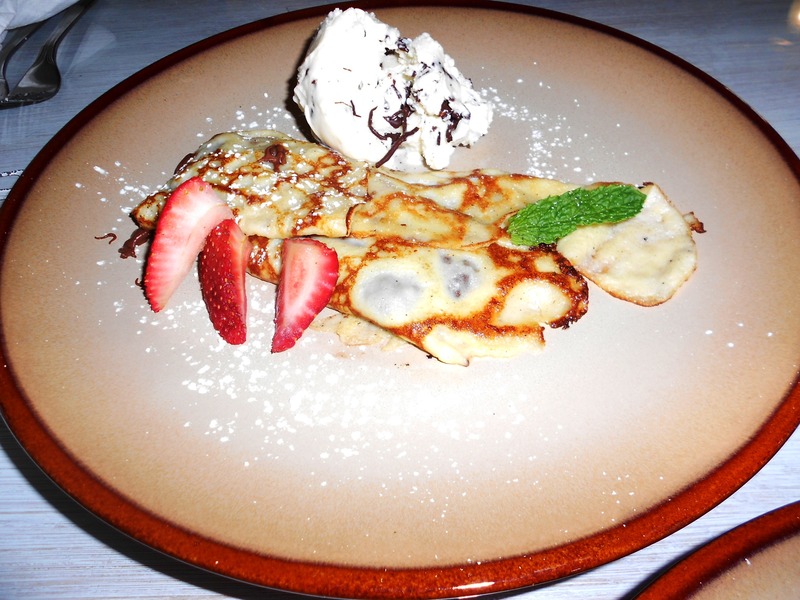 On my first visit to Wildflour I couldn’t resist ordering two crepes. I started with a buckwheat crepe filled with sautéed spring greens (kale was one) and caramelized onions with goat cheese crumbled on top and red pepper muhammara on the side ($7.95). 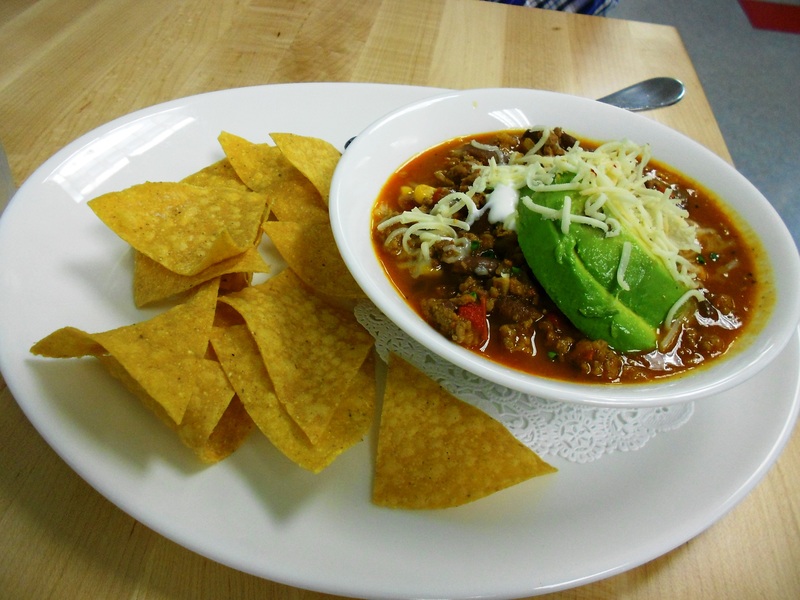 Big, hearty, and flavorful. If buckwheat is not to your taste, the alternative is a rice-lentil batter. For my dessert crepe I chose the “plain” batter, made from Marilyn’s own blend of rice, millet, and other flours, the result of which is a light, tasty, tender wrapper. Housemade lemon curd and ricotta was my chosen filler and even though 2 full-size crepes are really too much for one sitting, I gobbled it down. Below is my companion’s equally spectacular choice: Nutella with bent spoon ice cream on the side. Wildflour Bakery/Cafe is open for breakfast, lunch, and weekend brunch. Birthday cakes and full-size pies and tarts are available by special order. 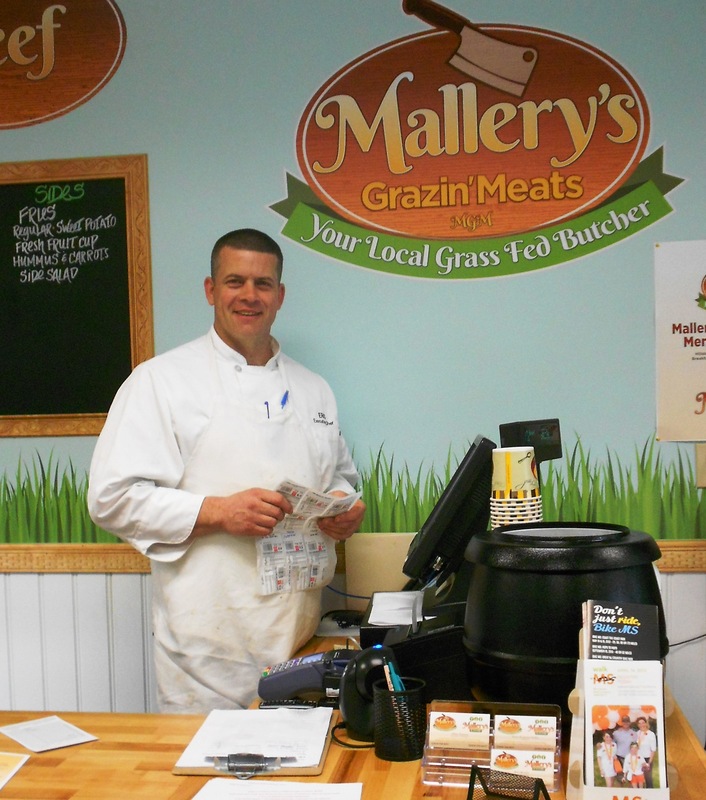 Fans of Mark & Lynne Faille’s organically raised meats from their Simply Grazin’ Farm and Mallery’s Grazin’ Meats butcher shop – both in Skillman – have added a butcher shop/cafe in Hillsborough called Mallery’s Eatery. Executive chef is none other than Eric Martin, the opening and long-time chef at Rat’s Restaurant at Grounds for Sculpture. Mallery’s Eatery is open for breakfast and lunch, tucked away deep in the recesses of the Kingsbridge Shopping Center on South Branch Road. 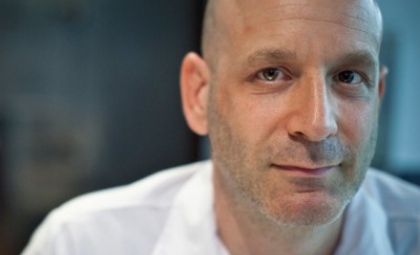 Did you catch this touching HuffPost piece by Marc Vetri about life as a stutterer? It resonated with me partially because back in 2005, after being wowed by a fabulous meal at his namesake Philly restaurant, I emailed him asking if he would be a phone-in guest on my live, Saturday morning radio talk show. It was only after he accepted that I learned he was a stutterer. I was impressed once again with the man – he wasn’t going to let that stop him. The interview went well and got a good response. I have to admit it was stressful on my end – it was hard not to jump in when he was struggling to get a word out – but it was a lesson in restraint well worth learning. New Brunswick-based nonprofit Elijah’s Promise (motto: “Food Changes Lives”) does so many important things so well it takes my breath away: soup kitchen, pay-what-you-can eatery, CSA, community garden, more social services than I can name. 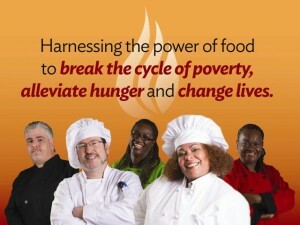 But one that’s particularly close to my heart is Promise Culinary School, an intensive, state-accredited program that prepares low-income adults to work in the dining industry. Chef’s Night, the school’s biggest fundraiser, with 35-plus restaurants participating, will take place on Monday, June 3rd from 6 to 9 pm at the rather grand Palace at Somerset Park. For menu, details, and tickets, click here. I am so distressed by the so-called Monsanto Protection Act that I’m breaking my unspoken rule. A worldwide March Against Monsanto has been called for Saturday, May 25th. Check out the list of participating continents, countries, states, and cities here. The official March against Monsanto Facebook page has so amassed more than 81,000 likes. – Research studies have shown that Monsanto’s genetically-modified foods can lead to serious health conditions such as the development of cancer tumors, infertility and birth defects. – In the United States, the FDA, the agency tasked with ensuring food safety for the population, is steered by ex-Monsanto executives, and we feel that’s a questionable conflict of interests and explains the lack of government-lead research on the long-term effects of GMO products. – Recently, the U.S. Congress and president collectively passed the nicknamed “Monsanto Protection Act” that, among other things, bans courts from halting the sale of Monsanto’s genetically-modified seeds. – For too long, Monsanto has been the benefactor of corporate subsidies and political favoritism. Organic and small farmers suffer losses while Monsanto continues to forge its monopoly over the world’s food supply, including exclusive patenting rights over seeds and genetic makeup. This is the inaugural event showcasing leading chefs from Montclair’s long list of terrific restaurants (and a couple of high-profile outliers from neighboring towns). It takes place on Saturday, June 1st and Sunday, June 2nd. A portion of the proceeds will go to the St. Joseph’s Children’s Hospital Center for Feeding and Swallowing and to Partners for Health Foundation. For the complete line-up, details on the Grand Tasting and Gala Dinner, and tickets, click here. This entry was posted in Events, Favorite Finds, Restaurants and tagged Ariane Duarte, chef Eric Martin, crepes Lawrenceville, CulinAriane, Elijah's Promise, French Culinary Institute, gluten free bakery, gluten free cafe, International Culinary Center, Kingsbridge Center, Lynne Faille, Mallery's Eatery, Mallery's Grazin' Meats, Marc Vetri, March Against Monsanto, Marilyn Besner, Mark Faille, Montclair Food & Wine Festival, Natural Gourmet, Palace at Somerset Park, Partners for Health Foundation, Promise Culinary School, Rat's restaurant, Simply Grazin', Skillman butcher, St. Joseph's Children's Hospital, Vetri Restaurant, Wildflour. Bookmark the permalink. Pat, kudos on the Monsanto post. So important for everyone — esp. those of us in the food world. I will share on our social sites as well. Yes, thanks for the Monsanto information. A really disgusting corporate ploy and very disappointing response by our Prez. On a more cheery note, your writing is really so VERY good. Thanks, Carol. You are very kind to say so. Much appreciated. Pat, I think you’re entitled to “get political” whenever your conscience and your principles demand it. Besides, if GMOs, food quality and safety issues, and hunger in America are “political” issues, then there’s something very wrong with our politics — which is, in fact, the case. But I don’t see how our civic life will be ameliorated if people fail to speak out. No future there. Michael: I try to keep in mind that visitors come to my website looking for facts, news, and information on food and drink, as well as critiques of restaurants in and around New Jersey. Although I often report on controversial food issues of the day I try hard to remain impartial and, as I stated, nonpolitical. That’s because I am keenly aware that my followers are not looking to me to tell them how to think or act on any particular issue. Saying that I support the March Against Monsanto is in effect telling them how they should think, and as such is really a reflection of how strongly I feel on this particular issue. But I will never be comfortable using my site to proselytize. I’m comfortable lecturing family, friends, and acquaintances, yes – and loud and often, as they will tell you – but that isn’t the mission of this space.